With summer time well and truly here (honestly) it makes sense to try and make the most of outdoor life while we can. 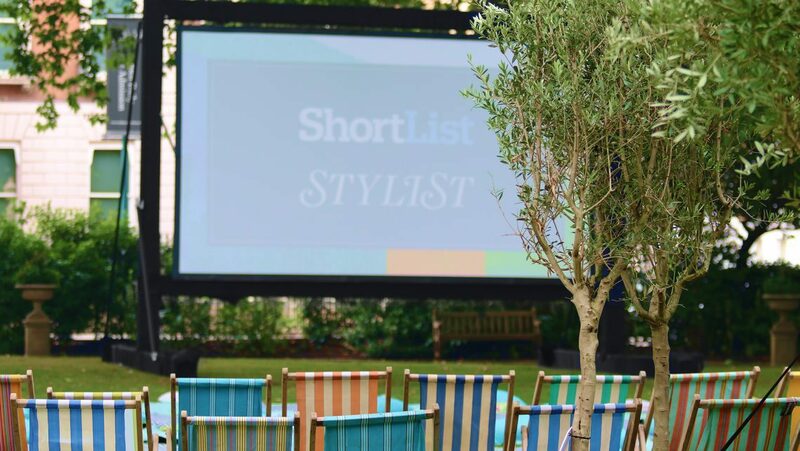 The Perception Team were at Manchester Square in London last week working on an outdoor cinema experience which our client, Shortlist and Stylist Magazine hosted with M&S Film Club. I went along and was looking forward to seeing the open-air cinema set up by Gareth, Will, Tim, Cem and Patrick and 5 local crew. On arrival, it was clear that they have perfected outdoor cinema, with a great set up of a huge screen surrounded by deckchairs and picnic blankets with cushions, with a rowing boat filled with wireless headphones. The whole experience was an excellent mix of entertainment with stunning food from the M&S Spirit of Summer range, some fizz and the odd Percy Pig. The atmosphere was relaxed and I would highly recommend getting over to a showing if you haven’t already been. The next showing is on 27th July at Manchester Square is the utterly romantic Captain Corelli’s Mandolin. Get your tickets here which include entrance, food, 3 drinks and dessert for £20! Doors open at 7pm. There will also be screenings in Birmingham and Liverpool. Click here for more information.